Recent sessions have been a stark reminder that trading in August is not for the faint-hearted. With the US and Europe on summer holidays, liquidity can be light making big swings more likely. The panic that engulfed the markets at the end of last week was showing no signs of going anywhere as trading began at the start of the new week. Traders were met with a sea of red as indices dived across the Asian session; investors shunned riskier assets overnight while safer havens such as the Japanese yen and Swiss Franc firmed; jitters surrounding the Turkish currency crisis were showing few signs of moving on. 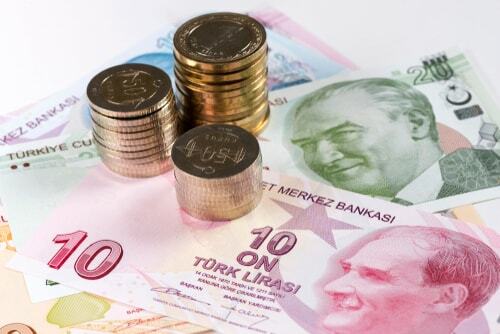 The Turkish Lira dropped a further 6.3% in trading overnight, breaking through TL7 and hitting an all-time low of TL7.2 after comments from Turkish President Recep Tayyip Erdogan over the weekend failed to calm investors. The lack of any new significant policy and a defiant stance from Erdogan means that traders will be bracing themselves for another day of hectic trading on Monday. Whilst the weakening of the Turkish economy is by no means a revelation, an admission of concern by the ECB over the possible impact of contagion was unexpected and weighed heavily on demand of riskier assets. Contagion risk centres on Italian, Spanish and French banks exposed to Turkish foreign currency debt, namely BBVA, UniCredit and BNP Paribas. These banks are thought to have the greatest exposure to Turkish debt and their loans are unhedged. As a result, we are expecting financials to have another tough day of trading on Monday and the euro is already down 0.3% versus the dollar, sub $1.14 as we move towards the European open. Whilst the euro struck a 13-month low overnight, flows into safe havens such as the US dollar, the Swiss Franc and the Japanese yen were on the increase. The Euro briefly touch a one-year low versus the Swiss Franc, was 1% lower versus the yen, close to its 10-week low of 125.26. The dollar was benefitting from its safe-haven status, hitting a one year high. So far, we are still not seeing the negative effects of the stronger dollar. Normally a stronger currency would curb exports, hitting inflation, but that hasn’t been the case so far in the US. Friday’s CPI data showed that US inflation hit 2.9% year on year in July, whilst core inflation hit its highest level since 2008. Investors will now look ahead to retail sales data later this week.